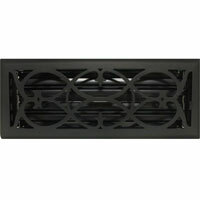 This Victorian style oil rubbed bronze floor register is as durable as it is beautiful. Simple one step installation. 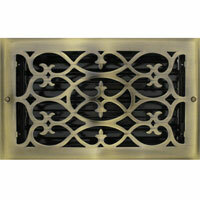 You will fall in love with this gorgeous brushed nickel floor register cover. 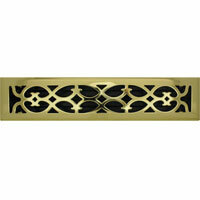 Ideal for areas where a bright brass floor register may not be to your liking. 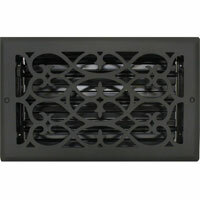 This register features an adjustable metal damper to help regulate air flow. 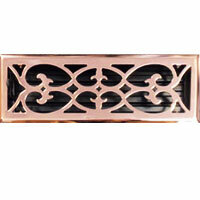 Copper floor registers in a Victorian design are sure to complement the other accent pieces in your home. The floor register cover comes with an adjustable damper. 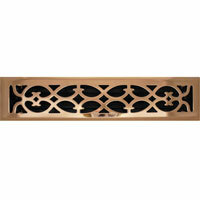 See for yourself how beautiful these copper floor registers are. 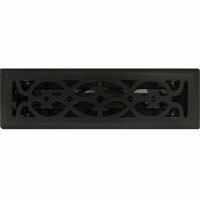 These traditional scroll Victorian floor registers feature a matte black finish. These are constructed with all steel construction including the adjustable damper. 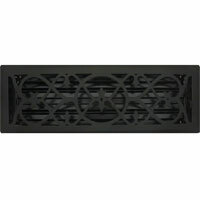 This beautiful oil rubbed bronze floor register features all steel construction with an adjustable damper. Available in multiple sizes and finishes. 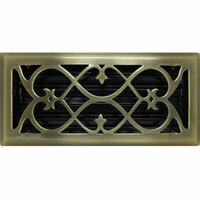 Decorative Victorian style floor registers offer a timeless look that is elegant in any home or office. 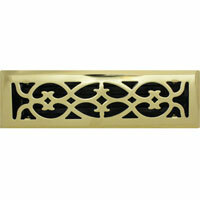 This register also comes at an affordable price! Order today! 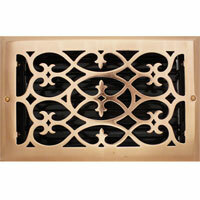 This beautiful copper floor register features all steel construction with an adjustable damper. Available in multiple sizes and finishes. 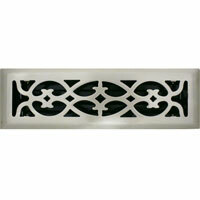 Victorian registers offer the look of cast iron without the price. These beautiful registers are all steel construction including the adjustable damper. 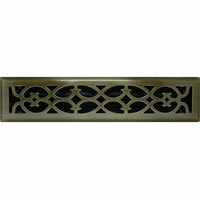 Oil rubbed bronze finish with a Victorian scroll design. 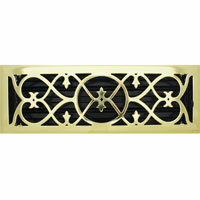 This register is suitable for both the floor and the wall (with the purchase of these Wall Clips). 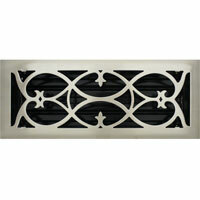 Victorian style floor registers can also be used as a sidewall register. Crafted with all steel construction and an adjustable damper for air flow comfort. Order online or call in today! 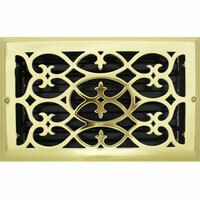 2 x 14 heating vents offer a plated finish with a protective top coat. Copper vents drop into the duct hole for installation. 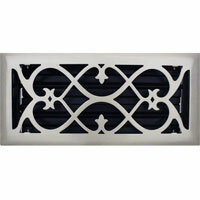 Heating vents feature the classic Victorian pattern. 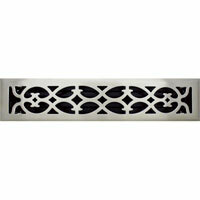 These beautifully designed floor registers feature all steel construction. One step drop - in installation with an adjustable steel damper. 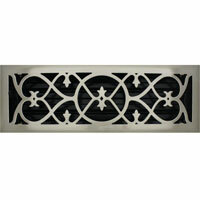 Beautifully crafted Victorian style floor registers can also be used on the wall. One step installations and an adjustable damper for air flow control. 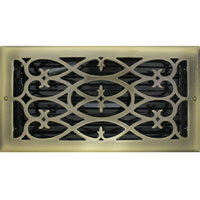 You will fall in love with this gorgeous brushed nickel floor register cover. 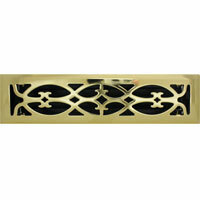 Ideal for areas where a bright brass floor register may not be to your liking. 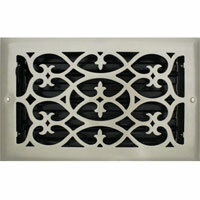 Victorian style floor registers can also be used as a sidewall register. Crafted with all steel construction and an adjustable damper for air flow comfort. 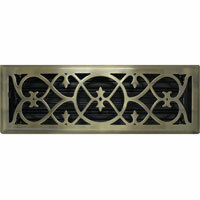 These beautiful Victorian design oil rubbed bronze floor registers offer all steel craftsmanship. 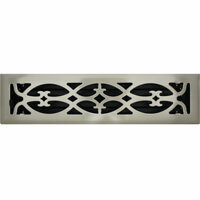 They offer the versatility of being able to work in the floor or on the wall (by using Wall Clips). 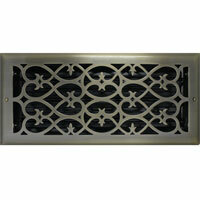 You will fall in love with this gorgeous brushed nickel floor register cover. 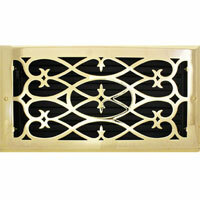 This register cover has a great look and comes at a price you can afford. 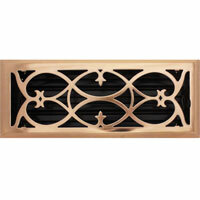 This floor register is made in the classic Victorian design with a copper finish. 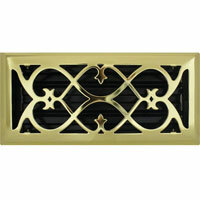 Suitable for the floor and wall mounting this is the ideal register. 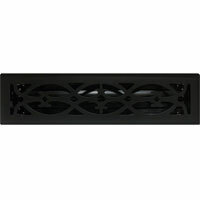 This beautifully crafted Victorian style floor register is constructed with all steel construction including the adjustable damper. 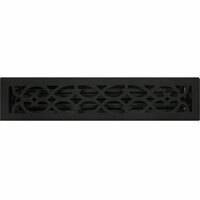 The floor register has a matte black finish and can also be wall mounted when you purchase coordinating wall clips. 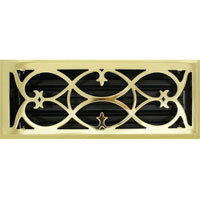 Victorian inspired register can be installed in the floor with ease. 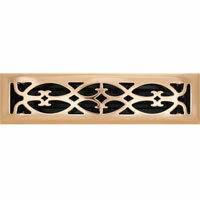 The beautiful scroll design is incredibly detailed and offsets wonderfully with oil rubbed bronze finish. 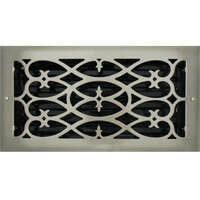 This beautiful brushed nickel floor register features all steel construction with an adjustable damper. Available in multiple sizes and finishes. Order today! 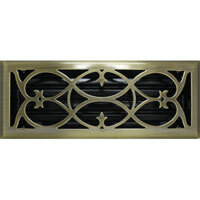 These Victorian style floor registers offer a flat black finish the feature a protective top coat to protect it. The construction is all steel including the adjustable damper to control air flow. 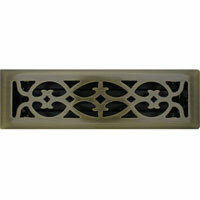 This Victorian style floor register will bring the look of elegance to any room. Oil rubbed bronze finish with an adjustable damper. 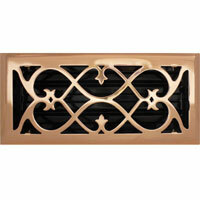 These Victorian style floor registers offer a copper plated finish that features a protective top coat to protect it from rust. The construction is all steel including the adjustable damper to control air flow. 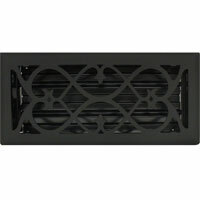 This floor register is designed in the classic Victorian pattern with a matte black finish. The construction is all steel including the adjustable damper. 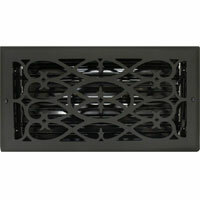 This 6 x 12 oil rubbed bronze Victorian style floor register can also be attached to the wall if that's where you need it. This brushed nickel floor register comes with an easily adjustable damper and multiple finish and size options! Call in or place your order online today! 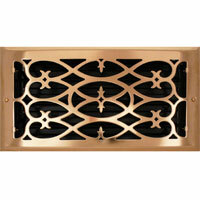 These gorgeous 6 x 12 copper floor registers have an easy drop-in style installation. Just place the register into a 6 x 12 inch hole and you are done. Register cover has a copper finish. 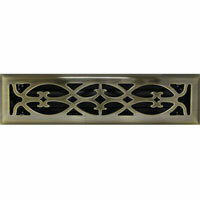 These beautifully crafted Victorian style registers can be used on the floor and the wall. Constructed of all steel including the adjustable damper for air comfort.